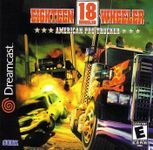 Publisher: Acclaim Entertainment Inc., SEGA of America, Inc.
Based on the Naomi arcade game, 18 Wheeler is a truck driving themed racing game where the player has to travel across the USA (in 5 stages) avoiding traffic, tornadoes & his bitter rival against a tight arcade-style time limit. In between traditional racing stages are slow speed "parking" challenges for increased score. The Dreamcast conversion featured a more traditional circuit-based multiplayer racing mode.